Why me? What did I do to deserve this? Am I not worthy too? The single thought that erodes our confidence is this one. Am I still worthy if I don’t have children? Because I didn’t have children, does that mean I’m not worthy? And perhaps the single thought that helped me change my thinking was acknowledging the inherent flaw in that earlier thought. I looked at women who have children easily, who don't have losses, who have never lost their innocence in pregnancy. They have not been judged to be worthy, just as I have not been judged to be unworthy. I look at women who get pregnant when they don't want to. Why does this happen? Well, just because it does. It doesn't mean that they are better than me. It doesn't mean they are luckier than me. They don't feel luckier, if the pregnancy wasn’t wanted. Those who struggle to cope physically, or financially, or emotionally, with a(nother) baby don't see the baby as a gift, even if that is how we would have seen one. I look at women with children who neglect them, abuse them, or abandon them, who expose them to violent or abusive partners, who pay more attention to their own needs than those of their child. Clearly, the biological act of having a baby is not evidence of their good character, or their good behaviour. These women are no better than me, or you. A child is never a reward for good behaviour, however much some of us might have wished that were so. Not having a baby is not a punishment, however much it might feel like that at times. This whole idea that only the deserving get what they want is really dangerous. I could discuss its implications in wider society and even geopolitics, but I won’t. I’ll just say that it is wrong, and accepting this makes us see things differently, and see others differently. It can though, take a while to reach acceptance. Women are very good at blaming ourselves. We search for answers. We expect answers. These days, when so much can be cured, solved, calculated or discovered, we can't understand why some of us can have babies and some of us can't. We get angry, and often, because there is no-one else we can blame, we blame ourselves. Pointlessly. Painfully. Sometimes destructively. I've lived and travelled around the world. I have seen wonderful people in difficult circumstances. I have seen awful people with family they don't value, with riches they don't appreciate or do anything good with. I have seen beloved, kind, good friends die young, I've seen those who have been tortured, and I've seen the selfish and even the downright evil live till they are very old. None of this is justified or right. None of this happens for a reason. None of this is because one person was judged to be worthy or not. None of this is because they were or were not being rewarded. It just is. No Kidding women and men are worthy. They are valued members of society. Their contributions to the world are different to those of parents, but are not lesser. Their very being shows that not everyone is the same, but that is okay. Being different does not mean less worthy. In this world we need to understand that. 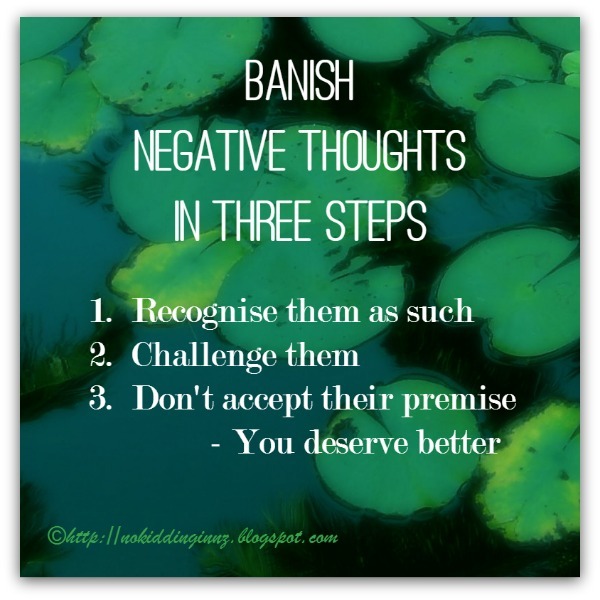 Finally, I’ll leave my system of banishing negative thoughts (below) that always reminds me that I’m a decent person, deserving, worthy. We are worthy. Don't forget that. What you have said is so important and true. It applies to many other situations in life as well. When something undesirable happens we have to remember it is not because we deserve it. It is not a punishment it just is. 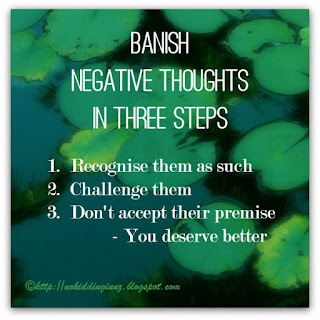 I love this, and the banishing negative thoughts system. I struggled with the verbiage to describe my non-parenting status... I agree that childless focuses too much on what is not, but childfree also doesn't feel totally accurate either since it doesn't hold the loss within. Hmmm. So bummed I missed World Childless Week with all the house and school stuff, but I love your thoughts on the subject!